The first volumes of HAL JORDAN AND THE GREEN LANTERN CORPS and GREEN LANTERNS are on the stands! But if you're wondering where the Green Lanterns Corps have been hiding out and how two rookies found themselves the Green Lanterns of Earth, you may want to grab these other recent collections. Even on their most routine days, the Green Lantern Corps don’t exactly have a job anyone could classify as easy, but lately things have been pretty complicated, even by their standards. Between rogue governments, dying universes, parasitic rings from alternate earths and renegade agents of Apokolips, the recent history of the Corps and its members can seem a little tricky to navigate. Luckily, Rebirth ushered in two brand new books that provide the perfect jumping on point for anyone who’s looking to sling a ring or two (or three, or more). And luckier still, they were both recently collected into their first trade paperbacks, making them easier than ever to jump into! 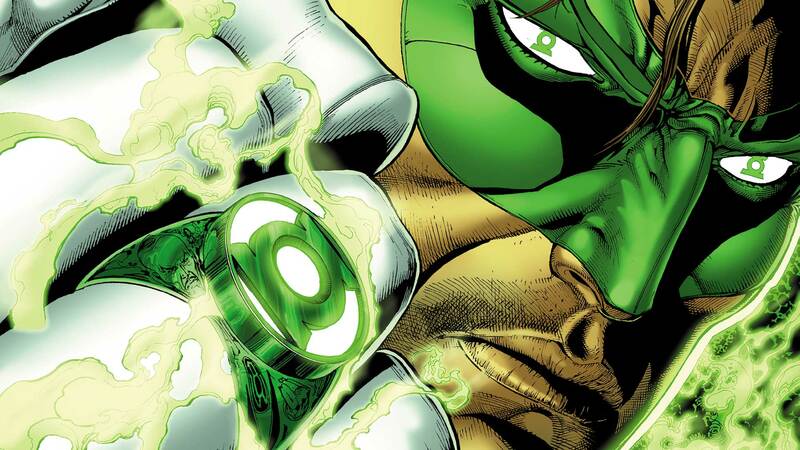 Hal Jordan and the Green Lantern Corps and Green Lanterns are two sides of the same cosmic peacekeeping coin, digging into and mining from different parts of the Corps’ not so distant past. That said, while both titles can largely be read on their own, the stage was set for them through a series of pre-Rebirth comics that are equally exciting reads—and have also recently been collected into trades. If you’re a Green Lantern completionist, or are a new reader looking to thoroughly dive into this rewarding world of color-coded rings and lanterns, we thought we’d take a look at some of the stories you may want to pick up alongside your copy of HAL JORDAN AND THE GREEN LANTERN CORPS VOL. 1 and GREEN LANTERNS VOL. 1. So fall in and recite your oaths, poozers. It’s time to save the galaxy. After being catastrophically hurled out of both space and time, the Green Lantern Corps find themselves, well...lost. Very, very lost. Trapped in a completely unidentifiable new universe and face to face with a myriad of impossible alien threats, in GREEN LANTERN CORPS: LOST ARMY, John Stewart must rally the Lanterns at his disposal to try and find a way home. That is, if home still exists. At this particular time in the DC Universe, Hal Jordan has gone rogue, and that kind of power in the wrong hands can spell disaster for more than just the Corps. And what’s more, with the entire GLC missing in action, ring-wearers from other colors of the emotional spectrum have taken it upon themselves to rise up, placing John’s entire plan under a disastrously ticking clock. Help may come from an unexpected quarter, however, as the remnants of the Corps find themselves face-to-face with some seemingly impossible allies. Here’s hoping they can be trusted. Picking up right where Lost Army leaves off, Edge of Oblivion raises the stakes even higher as the Corps learn that the universe they’re trapped in has hit the point of entropy. It’s dying out, slowly being erased from existence entirely—and if they don’t figure out a way to escape, all of them will be the next to go. Luckily (or, maybe, unluckily) they’re not alone within their dying prison. Another planet with giant-like inhabitants is also trapped within the dead universe, and the Corps may be able to ally themselves with these aliens to save them all. That is, of course, if these strangers actually are who they claim to be, and if they’re being completely honest about what landed them in this trouble to begin with. GREEN LANTERN CORPS: EDGE OF OBLIVION tells the story of the Lantern Corps’ struggle for survival and reintegration back into their own, living universe, which sets the stage for some...complicated relationships with the Sinestro Corps, who rushed to fill the void the GLC left behind them in their unplanned absence. Lost Army and Edge of Oblivion create one 12-issue interstellar arc that not only changes the status quo and the line up of the Corps forever, but sets the stage for Rebirth’s Hal Jordan and the Green Lantern Corps. This one’s kind of an undercover Green Lantern title…but, boy, is it worth a read. THE OMEGA MEN pulls from both cosmic and terrestrial corners of the DCU’s mythology to tell a self-contained story about what truly makes Kyle Rayner worthy of wielding the White Lantern ring—as well as the ethical knife’s edge someone with his power must be forced to walk each and every day. The lessons Kyle learns through his time as both prisoner and participant of the Omega Men are as subtle as they are far reaching, as he attempts to resituate himself alongside his brothers-in-arms across the pages of Hal Jordan and the Green Lantern Corps. In its final major crossover event before DC UNIVERSE: REBIRTH #1, the Justice League faced off against the whole of Apokolips in “Darkseid War,” which has been collected up across three trade paperbacks: JUSTICE LEAGUE VOL. 7: DARKSEID WAR, PART 1, JUSTICE LEAGUE VOL. 8: DARKSEID WAR, PART 2, and JUSTICE LEAGUE: DARKSEID WAR – THE POWER OF THE GODS. While “Darkseid War” relied upon the participation of the entire Justice League, it has a special impact in the life of Jessica Cruz and her transformation from the victim of the parasitic Power Ring from Earth-3 to an official member of the Green Lantern Corps. Jessica’s life on the pages of Green Lanterns alongside her partner, Simon Baz, would have never been possible without Jessica’s efforts to overcome her fear (and the effects of the Earth-3 ring) during the cataclysm on Apokolips. While Jessica overcomes her own (literal) demons, Hal Jordan is forced to confront his past during Darkseid War: Power of the Gods, when he is made to take the place of a literal god in the absence of both the Justice League and the GLC. You can find these stories (and more! ), along with Hal Jordan and the Green Lantern Corps Vol. 1: Sinestro’s Law and Green Lanterns Vol. 1: Rage Planet, on the shelves of bookstores and comic shops everywhere today! Rookie Green Lanterns Jessica Cruz and Simon Baz must overcome their clashing personalities and tackle the universeâ€™s toughest beat: Earth!